Here are a few questions about master volumes (not all of which are conventional preamp MVs, so feel free to move this thread elsewhere). 1. According to TUT, the addition of a series 100k resistor between the wiper of a conventional preamp master volume and the PI fixes the low-end roll off. But how does this happen with a series resistor and the series capacitor? 2. In the long list of FAQs on the LP site, it states that the LP-MV automatically keeps the depth of the presence effect proportional to the signal size. Is the LP-MV identical to the bootstrapped MV shown in TUT4 (the one with the dual-ganged pot), or is there an additional circuit to vary the depth of the presence effect? 3. I have yet to try the SL-MV, but I am guessing that it has no effect on the presence control. Is this correct? 1. Series cap? There is a cap into the splitter if that is what you are referring to and it is this cap that the 100k works against to retain response. 1. Yes, the input to the splitter. But how does the resistor work against a series capacitance to form a high-pass filter? 2. So the presence control will still function the same when the LP-MV is dialled back? 1. You have to think of the MV as the signal source with a variable impedance. A 1M pot can look like zero or anything up to a maximum of 250k as an equivalent source impedance. Working against a 22nF cap, 250k allows response to 28Hz. If the resistance drops to 5R, then bass rolls off because the RC time constant is now extremely short. Adding the 100k provides a minimum RC time constant that is quite long and thus bass response remains relatively intact over the sweep of the control. 2. You answered this in post-1. I have used the 100K at the input of splitter mod and it does indeed make the tone even even as the master was turned up. I 'll admit the I was used the the tone of the amp (JCM 800) with the master low so it did sound different to my ears with mod installed. I still have difficulty 'seeing' how the resistance (of the MV or the additional 100k R) works against the 22nF cap. 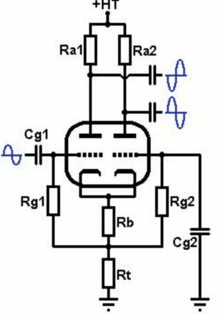 My understanding of high pass filters is limited to the various configurations of the circuit below, in which a series capacitance works against a shunt resistor that is on the output side of the cap. Now I surmise that a cap can also work against resistance on the input side of the cap. Is this the (or my) missing link? Your drawing shows a standard high-pass filter, which is opposite to the MV situation, but we can use it anyway. As R is made smaller, the roll-off point for the high-pass filter moves upward in frequency, and that is what happens as the MV wiper is swept from one end of the pot to the other. At the half-resistance point, 500k is in series with the signal and 500k is in parallel for a net effect of 250k. In circuit analysis, these portions of the pot are effectively in parallel, so you can see that as the wiper is moved from the half-resistance position towards either end, the net resistance goes to zero. In your circuit, R can be made variable and you have the same result. Now add a fixed-R in series with the cap. Changing the original R still has an effect but it always adds to the fixed-R and there is no a limit as to how high the bass roll-off can shift upwards in frequency - the new maximum bass roll-off frequency is much lower than without the fixed-R. Above, we were talking about the MV mod from The Ultimate Tone (TUT). The LP-MV kit from London Power is a completely different scenario as there is no variable resistance working against the coupling cap, and thus there is no change of bass response with sweep. You might think then that there might be a varying interaction with the tube itself and there is because of the tube's internal capacitance. The effect here will be a treble roll-off, but it is at such a high frequency as to be inconsequential in a guitar amp. There can be a stability issue due to the wiring added to the grids, which is why grid-stops should be added, as The Ultimate Tone Vol. 4 (TUT4) shows, and as are included in the kits. Yes, above we were talking about the improved conventional MV, as described in TUT. Following up on my last question, I will add this: does varying Rg1 in the photo below affect the low-pass roll-off? Or does the PI's tail resistor mitigate this effect? Yes, Rg1 in your drawing works against Cin to create a low-frequency roll-off. In a typical feedback-stacked splitter, the equivalent Rg1 value is higher than the schematic value because of the bootstrapping effect of the feedback node. In your drawing with no feedback and not stacked, Rg1 is Rg1. Changing Rg1 to a pot with the wiper only tied to the grid does not change the bass response over the sweep if the pot.